Numbers drawn were: 10 - 16 - 26 - 31. There was no Jackpot winner and no match 3's. Next week's Jackpot is €3,200 and the draw will be held during Bingo on Sunday, April 22. Clara GAA would like to congratulate Clara Musical Society on their very successful show “All Shook Up”. Best of luck to our senior team who will play against Shamrocks in the Tullamore Court Hotel Offaly Senior B Football Championship Round 2 in Tubber on Thursday evening at 7pm. All support is much appreciated. On Saturday our Division 5 team play Daingean at home at 6pm and on Thursday, April 26 we play Raheen in Geashill in Division 2 of the K Buggy Coaches Football League. Unfortunately, Brosna Gaels game against Drumcullen in the Molloy Environmental Systems Offaly Senior B Hurling Championship was postponed because of a timing issue. Well done to Boher Girls and Boher Boys who both won their matches against Cappagh N.S. in Clara during the week. Our deepest Sympathy is extended to Helen Murray and the Murray and Martin families on the death of Helens mother, Ella Martin, Athlone. Congratulations to Martin and Emily Jean Morgan who were married in Western Australia on Saturday. Ballycumber GAA History Group are trying to trace one of the men who went to World War 1 and is listed on a Roll of Honour which was displayed in Ballycumber Railway Station. The name appears as UCD Purdy and he was attached to the Irish Guards. Any information would be most welcome. The group meet in The Barracks, Ballycumber every second Tuesday at 8pm. The numbers drawn this week were 5, 10, 24, 31. No jackpot winner, two match three winners. Next week’s draw will be held in Stewarts on Monday night at 10 o’clock for a jackpot of €3,400. Our U12 girls played St. Broughan's in their first game of the season last week in Tubber. A special well done to the new players who donned the St. Manchan's jersey for the first time. The U12s play Moate in a challenge game this week. 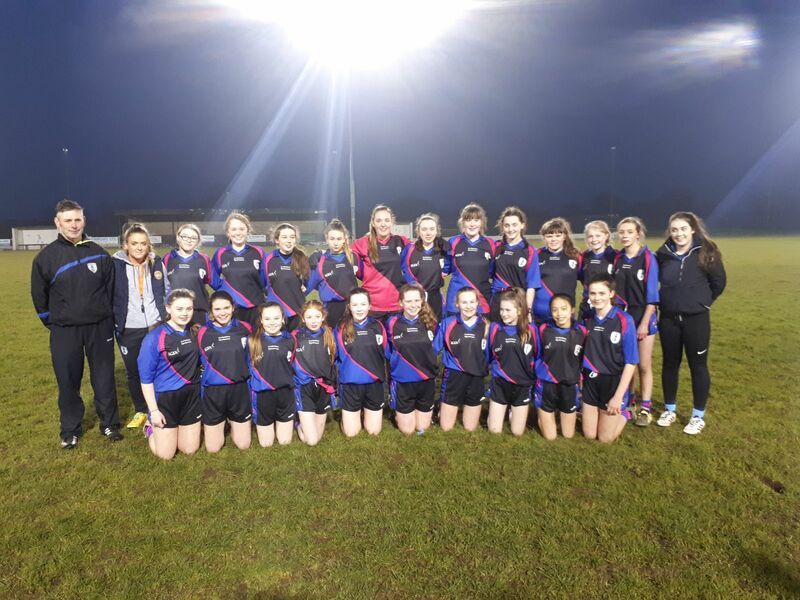 Well done to Martin and our U16 ladies who recorded their first win over St. Broughan's in the opening round of the U16 Championship. The U16s have a bye in the next round. The Junior Ladies traveled to Clonbullogue on Sunday last to play St. Broughans in the Division 3 league. Many thanks to St. Broughan's the great hospitality after the game. The annual St. Manchan's Fun Run/Walk will take place on Bank Holiday Monday, May 7 at 3pm at Tubber GAA clubhouse. Registration starts at 12 noon, Over 18s are €10.00, Over 12s are €5.00, Under 12s go Free & a Family is €20.00. All ages and fitness levels are most welcome. Join us for refreshments after in Tubber GAA clubhouse. in Direen’s, Cloneygowan on Monday 16 April 2018. Wednesday 18 th April @ 7pm in Killeigh. All Support would be appreciated. Na Fianna U17 (Minor) Footballers Rd 2 League fixture V St Broughans was postponed last Tuesday week and will be re-fixed for a later date. Na Fianna U15 Footballers opened their League campaign with defeat to St Manchan Gaels in Ballycumber last Monday week on a scoreline of 4-12 to 0-06 but battled bravely in the very difficult and testing conditions. St Manchan's scored their first goal with the first attack and by half time led 3-07 to 0-02. In the second half Na Fianna doubled their first half tally with 4 points and limited St Manchans to just a further 1-05. Murphy), Sean Flood (for Dara Crilly), Jack Cleary (for Stephen Hackett), Ciaran Murphy (for Aaron Gorman). be Re-Fixed for a later date. Fianna doubled their first half tally with 4 points and limited St Manchans to just a further 1-05.
the deficit to 2 but alas there was time for no more as Shamrocks held on for the win. SUBS: Kevin Healy, Cillian Murphy, Dan Daly (1-01).13 FOOTBALL LEAGUEIt was also defeat for Na Fianna U13 Footballers in their opening League fixture against Shamrocks last Friday evening in Rahan on a scoreline of 2-08 to 2-06. At half time the sides were level 0-04 to 1-01. A further 2 points apiece early in the second half before Na Fianna took the lead with their first goal on 17 mins following a goal mouth scramble finished to the net by Dan Daly. Shamrocks responded with 1-05 without reply to come from 3 points down to 5 up. Then in the final min a Na Fianna goal from Cein Gorman following a pass from Ryan Kinahan cut the deficit to 2 but alas there was time for no more as Shamrocks held on for the win. SUBS: Kevin Healy, Cillian Murphy, Dan Daly (1-01).